William Whitlam Pulham was born on 21 October 1843 and christened at St Martin at Oak, Norwich on 19 November 1843. William and Jemima were marriaed on 12 July 1864 in the parish church at Coltishall. William's sister Rebecca was a witness to the wedding. When Horace Welburn Pulham was born at the end of 1868, the family were living in Burnham, Essex. At that time William was employed as a grocer. 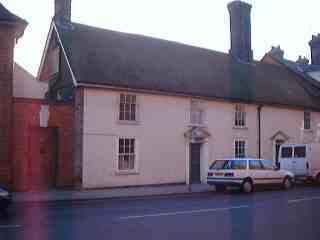 In 1873, William and his family lived in Double Street, Framlingham, Suffolk where he had a shop. Here he ran a family grocer, draper, haberdasher, milliner and provision merchants. Thus William was following his fathers occupation as a grocer. According to various trade directories, William moved to Framlingham some time between 1869 and 1873 and probably moved to Bury St Edmunds in 1879. 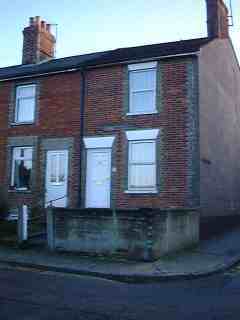 In 1881 the family were living at 25 Blomfield Street, Bury St Edmunds. This is a modest, small two storey end terrance house with a cellar/basement. At that time William gave his occupation as a commercial travelling draper. His younger brother Fredrick was also a draper and was living with the family. Indeed, it must have been rather crowded in the small end terrace house, for Maria's younger sister Elizabeth Welburn was also staying with the family. Acording to the 1881 census, Ernest and Edith were both born in Framlingham, Suffolk. However, neither of them were christened at the Framlingham parish church. The census also gave William's wife's name as Maria. At present, we do not know if Jessicah Ann had died and William remarried or Maria was Jessicah's pet name. Two years later, William was still a travelling draper according to the 1883 Suffolk edition of Kelly's Directory. In this edition of the directory, his name was given as 'Wm Whitlam Pulham'. This is the first occurance of the name 'Whitlam' which may be his mother's maiden name. Business must have been good, for the family had moved to a more substantial house at 7 Westgate Street. This is in a better part of the town just a few hundred yards from the Abbey. When William live in Westgate the house probably had a very large garden. Now, in its place to the left of the house stands the Theatre Royal. The family were still living in Westgate according to the 1885 and 1888 editions of Kelly's Directory. By this time, William was giving his occupation as 'Commercial Traveller'. By 1891, the family had moved again for they were not listed as living at 7 Westgate Street at the time of the census. This is confirmed by the fact that there are no entries for William in the 1891-92 edition of White's Directory. Indeed, the family may well have move out of East Anglia, for William was not listed as a commercial traveller anywhere in Cambridge, Norfolk or Suffolk. William's eldest son, Ernest in later life became dental surgeon in Leeds. It is believed that he changed his name to Thomson-Pulham, probably because of all the jokes about 'Mr Pull-them, the dentist'! 9 January 2000 - Kelly's Directory of Bury St Edmunds, Suffolk: 1846,1875,1879,1883,1885,1892 editions. 10 January 2000 - Kelly's Directory of Suffolk: 1869, 1873, 1874, 1888.